But you’re not sure you actually believe that saturated fats are good for you. Maybe you already have high cholesterol and you have heard that saturated fats increase cholesterol. Well, I’d like to clear all this confusion about saturated fats and cholesterol. Let’s begin. The term “lipid hypothesis” the theory that saturated fats and cholesterol in our food raise cholesterol levels in the blood, leading to heart disease, was coined in the 1950s by Ancel Keys, author of several epidemiological studies that, although in our opinion was severely flawed, are frequently quoted as supporting the theory that animal fats cause heart disease. This theory is so prevalent, so widely believed, and so fundamental to the modern treatment of cardiovascular illness, that up until now you’ve probably never heard that it is only one theory of heart disease, and that a different reading of the data, along with volumes of other research, supports a very different conclusion: that saturated fats do not contribute to heart disease and in fact actually protect against this and many other diseases. Cholesterol is often referred to as a fat, but is actually an alcohol that behaves like fat. It has a coating called lipoprotein, which is why it can be carried in the blood. High-density lipoproteins (HDL) carry cholesterol away from the cells to the liver, and low-density lipoproteins (LDL) carry cholesterol to the cells. Both HDL and LDL play critical roles in body chemistry, so one is not necessarily better than the other. Cholesterol helps your body deal with stress and protects you against heart disease and cancer. Cholesterol can be made into vitamin D by your body, which is vital for the bones and nervous system, proper growth, insulin production, and immune system function. Cholesterol protects us against free radical damage that leads to heart disease and cancer. Cholesterol is used by our body to repair damaged cells. When someone states that fat and cholesterol cause our arteries to harden, it is like accusing white blood cells of causing infection. Does Saturated Fat Raise Cholesterol? No. Multiple studies have been done to determine if the levels of cholesterol have anything to do with eating saturated fat, and they have determined that there is no connection. The same study saw low levels of cholesterol in people who ate small amounts of animal fat and in people who ate the most animal fat. The study also found high cholesterol in people who ate high, medium, and low amounts of animal fat. Does Cholesterol Cause Atherosclerosis And Heart Disease? No. Much research indicates that high blood cholesterol has no relationship with the degree of plaque buildup in arteries. In 2003 a study published in the American Journal of Cardiology found that people who lowered their cholesterol levels did not reduce the plaque buildup in their arteries. In fact, after one year of taking medication to lower their cholesterol, the people had a 9% increase in plaque buildup! This suggests that plaque buildup is not related to cholesterol level. After looking at all the studies involving women and cholesterol, it was found that women with high cholesterol levels are not at a risk factor for heart disease. For women low cholesterol is more dangerous than high cholesterol. It was the women with very high cholesterol levels that lived the longest. Those women with low cholesterol levels had a death rate over five times higher! Are Polyunsaturated Oils “Heart Healthy” As We’ve Been Led To Believe? No. First, I believe that the power of the vegetable industry explains why myths about the “dangers” of saturated fat and cholesterol have dominated popular thinking about what constitutes a healthy diet. Commercial oils such as, corn, safflower, soy, and canola, are extracted by toxic chemicals at high temperatures, which turns them rancid, destroys their nutrients, and produces free radicals which contribute to cancer, heart disease, and infertility. Even when cold pressed, polyunsaturated oils still contribute to multiple diseases. There is also concern over the omega-3 to omega-6 ratio of polyunsaturated oils, where the omega-6 is much higher. Read more about this ratio in my post: The Good, The Bad, and The Ugly Fats. Just like fats, heat and oxygen also damage cholesterol. Damaged, or oxidized cholesterol can lead to plaque buildup in arteries, which can result in heart disease. Therefore we need to avoid foods that contain damaged cholesterol, such as, powered eggs and powered milk. Manufacturers add them to reduced-fat milk, yogurt, and other dairy products! My study about cholesterol and fats just convince me more that we should be eating food the way God made them. A trend I see again and again is when man decides he can make food “better” he ends up making it worse! If you would like to learn more about eating this way, check out my post: Where I Get My Food Advice and my Reading Page. 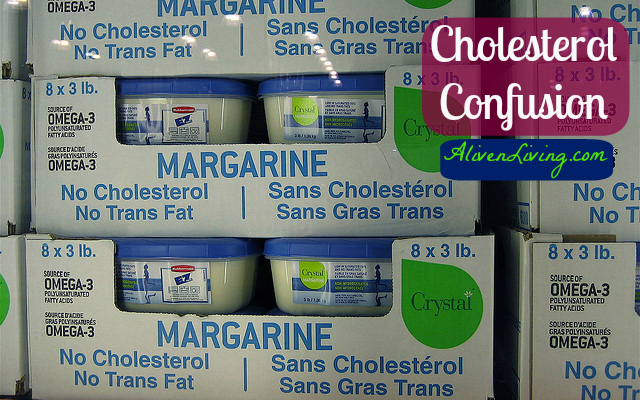 Still Confused About Cholesterol? Ask Your Question In The Comments Below.